Tommy Peoples passed away on the 4th August 2018. The most influential fiddler of his generation, and an inspiration to countless musicians worldwide, his compositions were, like his playing style, unique, very personal, and have become part of the tradition. Below are Tommy’s obituary from the Irish Times newspaper, and a statement by President Michael D. Higgins on his passing. There have been a number of requests about his book, and the good news is that it is still available, as is his CD. 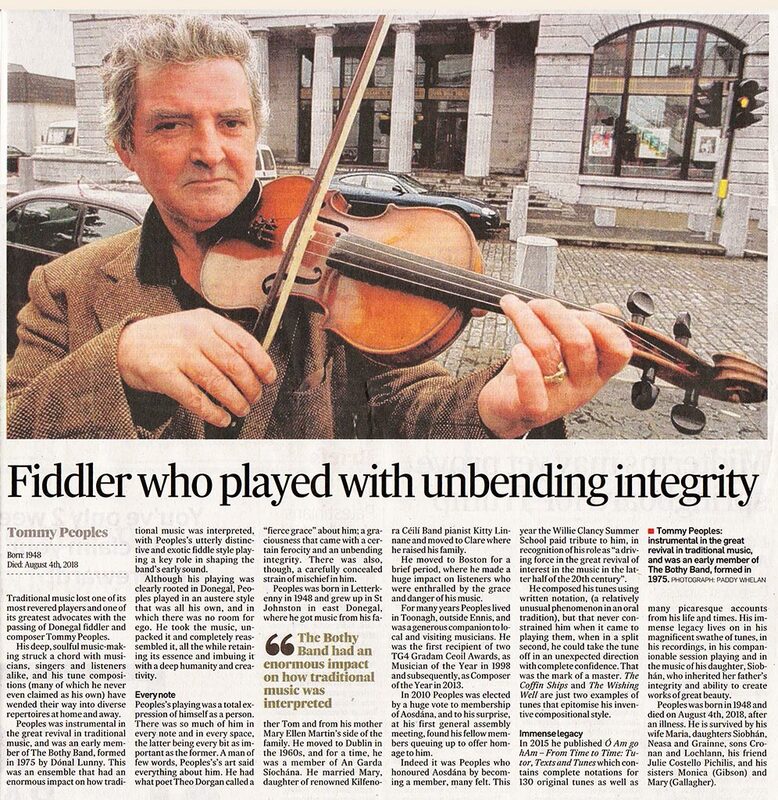 “I have learned with great sadness of the death of Tommy Peoples, the renowned Donegal fiddle player and composer. Regarded as a master of his craft, Tommy enchanted audiences at home and abroad with his unique style of music, playing with the Kilfenora CéilíBand, the Bothy Band and many other legendary figures in the world of traditional Irish Music. Tommy has the distinction of receiving two TG4 Gradam Awards, for Traditional Musician of the Year in 1998 and Composer of the Year in 2013, a feat not achieved before or since. He also had a great love of the Irish language, which he considered to be a very important part of Irish life. I, with so many others have the warmest memories of Tommy as a friend over many decades and we shall all greatly miss him. Sabina and I send our deepest condolences to his family, friends and all those who knew him.